The above is a photo of our simplest cruciform hilt, which we refer to as our "Gothic" model. This design dates back to the middle ages. 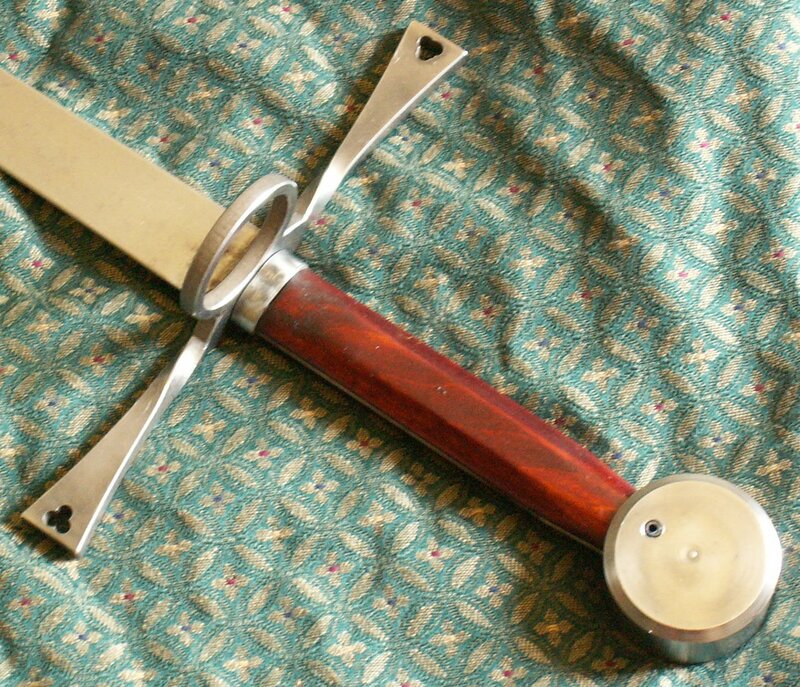 The example above in mounted on our flat tang blade for use as an arming sword. Mounted on a curved blade it makes a good fencing falchion. Our hilt consists of an 8 inch long cross guard, and one (unfilled) side ring. The side ring measures 2 inches long by 1 1/2 inches wide and can be removed at no additional cost. An optional perforated plate may be added to cover the side ring at a cost of $10. The wooden grip is from 5 1/4 to 6 inches long. In the above photo the pommel is our large 2 inch diameter disk. A pear shaped or ball pommel may be substituted at no extra charge.